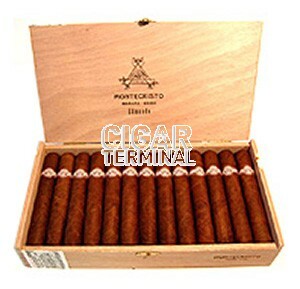 The Montecristo Grand Edmundo Limited Edition 2010 is a beauty, a medium Canonazo, 5.9” (150mm) long, of 52 ring gauge, it comes in a box of 10 cigars. • A rich and powerful cigar showing loads of coffee flavors such as roasted coffee along with a heavy dose of chocolate. • The Grand Edmundo Limited Edition is made for the aficionados of big ring gauge Havanos. It is a very refined sweet and smooth cigar. Try pairing this with a port and dark chocolate. A delicious combination. A thing of art. The wrapper is almost seamless and glistens with an oily sheen. The foot shows a good bunch and the triple cap is carefully applied. Strong essence of barnyard. Pre-light draw of chocolate. A slow even burn with an easy draw. When you light the cigar up, you are greeted with coffee and cocoa flavor that is reminiscent of chocolate pudding and espresso. It is still chocolaty, but only slightly less so. We now have some notes of cream, honey, cedar and vanilla with a very pleasant sweetness. The last third yields some dark toast with a hint of nutmeg and sautéed mushroom and still chocolaty. In summary, the entirety of the cigar remained very mild-medium and at no point was ever harsh. Definitely a dessert cigar due to the heavy tone of chocolate. Very pleasant indeed.